Lychee is a tropical and subtropical fruit tree native to the Kwangtung and Fukien provinces of China, and now cultivated in many parts of the world. The fresh fruit has a "delicate, whitish pulp" with a floral smell and a fragrant, sweet flavor. Since this perfume-like flavor is lost in the process of canning, the fruit is usually eaten fresh. Litchi chinensis is an evergreen tree that is frequently less than 19 m tall, sometimes reaching more than 15 m. The bark is grey-black, the branches a brownish red. Leaves are 10 to 25 cm or longer, with leaflets in 2-4 pairs. Litchee have a similar foliage to the Lauraceae family likely due to convergent evolution. They are adapted by developing leaves that repel water, and are called laurophyll or lauroid leaves. Flowers grow on a terminal inflorescence with many panicles on the current season's growth. The panicles grow in clusters of ten or more, reaching 10 to 40 cm or longer, holding hundreds of small white, yellow, or green flowers that are distinctively fragrant. Fruits mature in 80–112 days, depending on climate, location, and cultivar. Fruits reach up to 5 cm long and 4 cm wide, varying in shape from round, to ovoid, to heart-shaped. The thin, tough inedible skin is green when immature, ripening to red or pink-red, and is smooth or covered with small sharp protuberances. The skin turns brown and dry when left out after harvesting. The fleshy, edible portion of the fruit is an aril, surrounding one dark brown inedible seed. Fruit is a great source of vitamin C, a vitamin that the body does not produce naturally. Vitamin C helps the body to fight heart disease and cancer. Vitamin C is good for our bones, skin and tissue, and it gives a very important vitamin to our overall good health. Through the high content vitamin C content of the lychee fruit, the fruit benefits those suffering from colds, fevers and sore throats. Lychee also helps the body to digest food properly for the best nutrition and an added boost of health. Lychee, the Chinese believe, also has the ability to relieve pain and shrink swollen glands. People in China treat these symptoms with the lychee fruit using ancient Chinese medicines and they attest to its powers even though there are currently no studies out there that give scientific weight to this argument. Along with these health benefits lychee also contains phosphorous, calcium, magnesium and protein. Though the lychee fruit is native to Asia, the popularity and reputation of the fruit as a healthful fruit has contributed to the commercial growth of lychee trees in California and Florida. 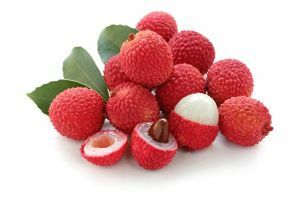 Lychee can be found in Asian supermarkets in cans or dried or they are found in jellies, jams, marmalades or sauces in Asian cuisine.